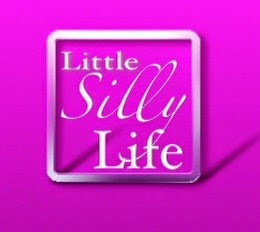 Dedicated to the people and moments that make My Little Silly Life.. just that. First, let me start off by apologizing to you. I'm so sorry that someone ruined the magic of Christmas for you at such a young age. Maybe it was an older sibling or kid at school just being mean, but I'm sure it crushed you. And, as a mom, I'm sorry. I'm sorry someone crushed your spirit. I'm sure you remember what that felt like. That feeling when your heart gets hurt, when someone is mean, for no other reason than because someone was mean to them. It made you feel good to destroying the spirit of a child that still believes. You told my son that Santa was really just Mommy and Daddy that get the presents. And while that may be true, doesn't that make Santa real? My parents were Santa, your parents are Santa, I'm Santa and someday, you will be Santa and to your kids, you too, will be real. Because of you, I had to look into my son's sad eyes. Because of you I had to lie to my son. You say that I was already lying. Lying about a man called Santa. But you see, I'm not lying to my son. There is a Santa. He may not be a fat jolly old man that rides in a sleight, but he is real. Santa is the spirit of giving and doing good for others. It's seeing a smile on a strangers face from a random act of kindness. Santa is the joy in your child's face when he got the special toy he asked for when sitting on Santa's lap. Santa is happiness. Santa is the way your children ooh and ahh at the houses decorated in Christmas lights. It's hearing Christmas carols. It's the sound of your children's feet running down the hall to see what Santa left under the tree. So, you see, Santa is real. And my Christmas wish for you is that Santa brings you your spirit back. That you use that spirit for good. That you remember what it was like to believe and that you believe again. For now, my son still believes and I hope to keep the magic alive for him as long as I can. My husband loves Entenmann's Apple Puffs. But most of the time I look for them in the store, I can't find them. Then a video popped up a few times in my Facebook newsfeed on how to make these at home. I figured this was a perfect solution, I can make them anytime I want and I know what ingredients are going into them. And I'll probably get more than what I get in the Entenmann's box. When I couldn't sleep last night, I figured, why not give them a try. I searched Pinterest to try and find the video and couldn't, but after some searching, I was able to locate the original instructional video from Tip Hero. I wrote down the directions and ingredients and headed to the kitchen. I've made it easy for you and listed everything here. I'll add my comments and suggestions after the recipe. 7. 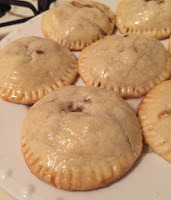 Place top pie crust on top and use a cookie cutter to make a "pocket"
- For me, 4 cups of apples were WAY too much. I have a lot of leftover cooked apple mixture, but it's gonna go great with some vanilla ice cream! When I make regular apple pie, I use half Granny Smith and half Gala, so I did that here too. - I didn't have apple pie spice and it didn't make a difference. - In the video it appears that she gets quiet a few "pies" out of a standard pie crust, I was only able to get 7 and there was a lot of leftover crust. - I didn't have a cookie cutter in this shape, but found a drinking glass was a great substitute. 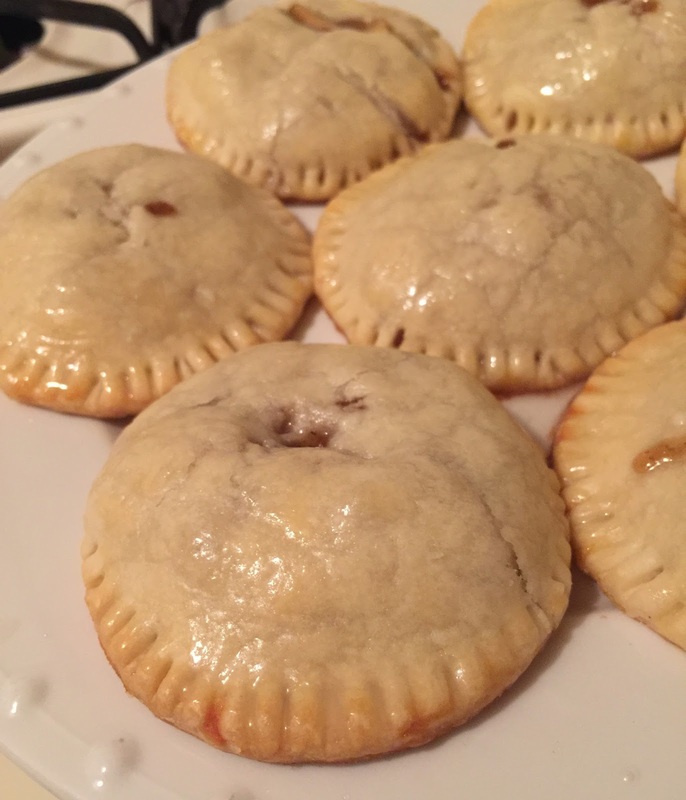 - While the pies were good, it really tasted more like a mini apple pie than a puff. Next time, I'm going to try a puff pastry. - She didn't give instructions for the egg wash so I just looked it up, maybe it was a different egg wash than she used, but the pies didn't brown as nicely as hers did. - 15-18 minutes in the oven didn't seem to be quite enough, could also be my oven, so start with that timing and adjust as necessary. - I also looked up the recipe for the frosting, it was entirely too watery, so I made it a glaze. - All in all, these were pretty good and an okay substitute for the original. I'll definitely be working to perfect this one!! I'm very particular about my Christmas trees. I get it from my Mom. Her trees were always (and still are) so beautiful. The ornaments are perfectly coordinated and placed in just the right spot. Every. Single. Time. I'll typically spend the entire time it's up, fluffing, rearranging and adjusting. I prefer even numbers and things that are symmetrical. I have weird quirks like that, but we'll talk about that another time. This year with an 18 month old running around, I knew it would be nearly impossible to have my perfect tree. I needed a Plan B. A plan that would allow me to look past the bunched up ornaments and be okay with a tree that is in complete chaos. Cause really, it's complete and utter chaos. Then I came across a photo on Facebook. It seemed like the answer and one that I could be okay with. One that would make me set aside my quirks and have a "fun" tree. My husband and 6 year old are huge Star Wars fans, okay, I am too. So, with the movie coming out the week before Christmas, what better way to celebrate Star Wars and Christmas than with a Darth Vader Christmas tree. Yes, we dressed up our tree as Darth Vader and decorated with plastic Christmas balls and my son's Star Wars toy figures, which he picked out with very strategic reasoning. Yup, he's got it too. To my son, in advance, I'm so sorry. LOL. By now, the ornaments and toys have made it to the top half of the tree. As the little one takes them off, the big one strategically places them right out of the little ones reach. Smart and a little evil. While I miss my ornaments and my perfectly symmetrical tree, I am happy that the tree is a little untraditional this year. It's a mess and it is the most beautiful mess I have ever seen. The last few years have been tough. We said goodbye to far too many beloved family members and friends, we’ve had financial struggles, lost jobs, started new jobs, made new friends and lost touch with others. And while I’m eternally grateful for my family and friends and all the good things, I’m also beginning to be grateful for the bad things too. I know, who the hell would be grateful for pain and sadness? It’s through the sadness that I have learned and discovered things about myself and my world that I may not have seen without those struggles. 1. I’m grateful for crappy baseboard heat. It gives me a reason to snuggle close with my husband and our boys. 2. I’m grateful for financial struggles. Watching every penny has made me reevaluate my needs versus my wants. I can tell you, the two were very different. 3. I am grateful for loss. It has made me realize that tomorrow isn’t promised and to treasure even the most seemingly insignificant moments. 4. I’m grateful for lost friendships. In retrospect, those friendships were over long before they ended. They were just anchors. 5. I’m grateful for quitting my job. Going back to work when my youngest was just 7 weeks was awful. While we have to live more modestly, I’ll will never get this time with them again. 6. I’m grateful for the times my husband wasn’t working. He got to share in our boys growing up and I am grateful for the back up. 7. I’m grateful for failure. Enough said. 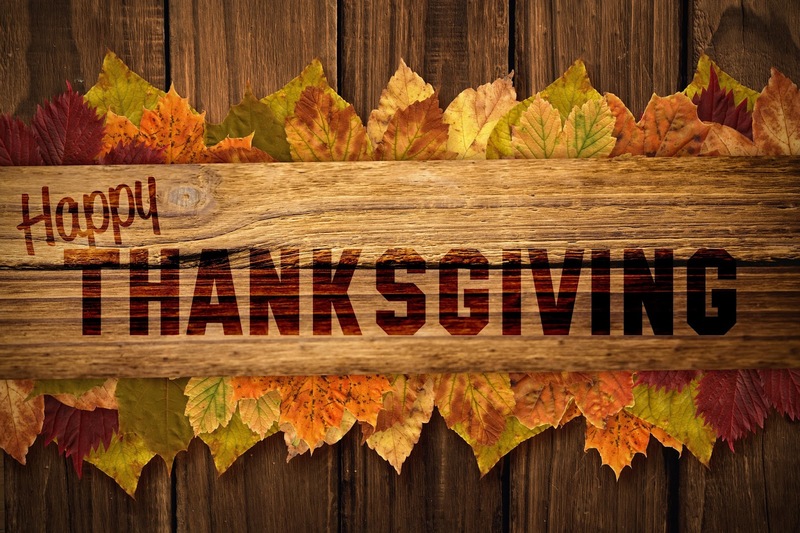 So, at Thanksgiving, it is easy to be thankful for the things that went right, but also, be grateful for the things that didn’t go so well. There just may be something in there to be thankful for. Early last year, I began writing a poem for my Dad. I wanted to do something special for him for Father's Day. My father was a man like no other. He loved everybody and he never judged. Even if he didn't like you, you'd never know it. He helped anyone he could. He gave me and my brother a great childhood, we rarely wanted for anything. He took such good care of my mother. He taught me so many valuable lessons, which at the time, seemed useless. But as I have gotten older, I have found the lessons and advice prove to be more useful than, I think, he even realized they would be. I wanted to honor that and him. He unfortunately passed away before I completed it. I was too heartbroken over losing him and too overwhelmed with a new baby that I couldn't even fathom the thought of finishing it in time for Father's Day. But over the last few months, I have given it a second look and have finally completed it with an alternate ending. So, this is for you Dad. A little something to tell you how much you mean to me and how lucky I am to have you as my Dad. I love and miss you always. A little girl's daddy is her first love. He is the man that will raise the bar for all other men that come into her life. He is her first protector. She will love him unconditionally and look up to him. She looks to make him proud. He teaches her the lessons she needs to take care of her self and protect herself. He teaches her to use her hands, to fix her car and install a new faucet. He guides her in the direction that can best protect her and make her better than him. But when she chooses her own path, he is there to cheer her on when it goes well. And he's there to pick up the pieces and set her straight when she falls. She will defy him, disappoint him and make him mad. She will make him happy and proud. Through it all, he loves her. He gives her to another man with faith that he has taught her well. That she has chosen the right man. That he has taught her as much as he can to make her successful in her own life. He watches her manage her own life, making her own way in the world. He watches her build a home with her husband. He boasts with pride when she begins a family of her own. He watches her raise that family the best she can with all the tools he has given her. But even in death, he will continue to protect, teach, guide and love her. In this age of technology and electronic everything, there is a login and password for everything. Have you ever tried to enter your PIN into the microwave, I haven't, just saying...LOL. On a typical day, you could require a login and password multiple times a day for multiple functions. You use a login and password to access your computer, another to access your email and another to log in to a website, like Facebook. You log in to your bank account to confirm any transactions. And this is all during your morning cup of coffee. Then when you get work and you have a whole other set of logins and passwords. Personally, I know I have too many to remember and constantly having to reset passwords can get pretty annoying. And even then, you have to request a temporary password, log in to your email to get the link, then, probably the worst part of it all, trying to think of a new password that no one will guess, that hasn't been used for the last 5 passwords, contains 8-12 characters which must include a capital letter, a number and a symbol. As if that isn't enough, you still have to log in to the website! I hate to admit it, but there was a time when I had all of my login and password information written on a piece of paper and tucked away "safely" in my wallet. This was until my husband read about an app called 1password. 1password is available on both iOS and Android devices for free, however, there is a pro version that you can purchase for $6.99. The paid version offers more features and if you have or plan to get an Apple Watch, you will need the pro version for it to work on your watch. You can store all your important information, such as logins and passwords, secure notes and even credit cards. I personally have only used the login and password function on the free version, so far. 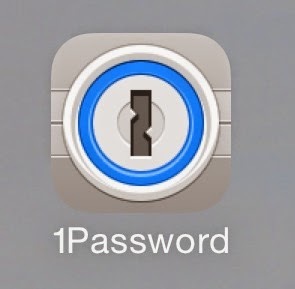 So, how does 1password work? First download the app. Seriously, this app will change your life. If you have an Apple device with Touch ID, you can use your Touch ID to enter into the 1password app. If you have an older Apple device or Android device, you can still use this app. You have the option of setting up a master password. I recommend setting up the master password. If someone else needs to access this information, Touch ID will do no good. So, where do you store that password? When you set up your master password, you can add hints that will automatically pop up if you forget your password. My husband uses the app as well, and we each have the other's master password stored. This is a great idea in the event something happens and we need to access the other person's information. Here are your logins and passwords. If you click on logins, you will see all of your entered logins in alphebetical order or simply type the login you are searching for into the search field and it will pull it up. You can also add your most frequently used accounts under a favorites list for easy access. These are the categories that are offered in the free version. Again, I have only used the login category. The credit card category allows you to enter all your credit card info such as number, expiration date and secure access code. I have this information stored under the login for that account. I find having it all in one place is convenient. Here you will want to add the login name. So for example, if I was adding my Kohls information, I would enter "Kohls" in the login name. This is how is will appear in your list. Once you hit next, you will be prompted to enter your username or email for the account. or you can ask 1password to auto generate a random password for you. Now, enter the web address for the site. This is a very helpful feature of this app. If you need to access your account, simply click on the web address and 1password will automatically populate the login and password based on the information you have entered. So, even if you select a random password, you won't have to worry about remembering it. If you login from a computer and need your password, simply click on the password and hit "reveal". It will show you your password. Once you are done entering login information and save, you can go into the edit field and add notes. I use my notes section to enter any information that i may need at my finger tips, like credit card number, expiration date, or CV code. I've also added account numbers. Another really great feature of 1password is the ability to share account information. So, if you have an account, like a credit card that you share with someone, you both will have the information stored in the 1password app. The app syncs across all of your devices, but only when it is connected to your home network, another great security feature. I would definitely recommend this app to anyone that has just too many logins and passwords to remember. I find having all of my information readily available makes for a seamless workflow. Do you have any apps that help you run your life that you just can't live without? Mom-ents: Would You Sell Your Wedding Dress? My Mom and I were recently talking about things that were stored at her house and how if needed, where she could downsize. I don't have much left there, but what I do have left there is my wedding dress. It's stored in the closet in my childhood bedroom. I never brought it to our home because well, in an apartment with 2 kids, storage space is highly sought after real estate and there is little room for things that don't serve a functional purpose. When I saw my dress, I just knew that it was the ONE. It was the dress that I would marry my husband in. The beginning of our "forever". It was right off the rack, but it was perfect. It fit just right in all the right places, it was elegant and simple. It had just enough bling to sparkle. However, my mother's dress holds so much more sentimental value. My grandmother had the gift of being able to do wonderful things with fabric and a sewing machine. She used that gift and made my mother's wedding dress. Mom always thought that maybe someday her daughter would wear it. And while it is a beautiful dress, it wasn't my style. Then she thought, well maybe it can be made into a granddaughter's Christening gown. She has 4 grandsons. So, what does she do with it now? Hold on to it, sell it, create something new? Then I saw an article posted my The Huffington Post, originally from Buzzfeed, were daughter's try on their mom's wedding dress and do a photo shoot. I thought that was a pretty awesome idea! Create a new memory from an old one. What do you think, Mom? Could be fun! I started thinking about what I wanted to do with my wedding dress. I always just thought that I would store it way for the rest of my life and someday when I was old and grey, make that choice. I also used to be a pack rat. LOL. Did I want to continue to store it in the hopes that I would have a granddaughter someday? Chances are it would be out of style anyway. Did I want to sell it or donate it? Did I want to create something more functional? Or maybe create a new dress for a 10 year vow renewal...Hmmm, that sounds interesting. 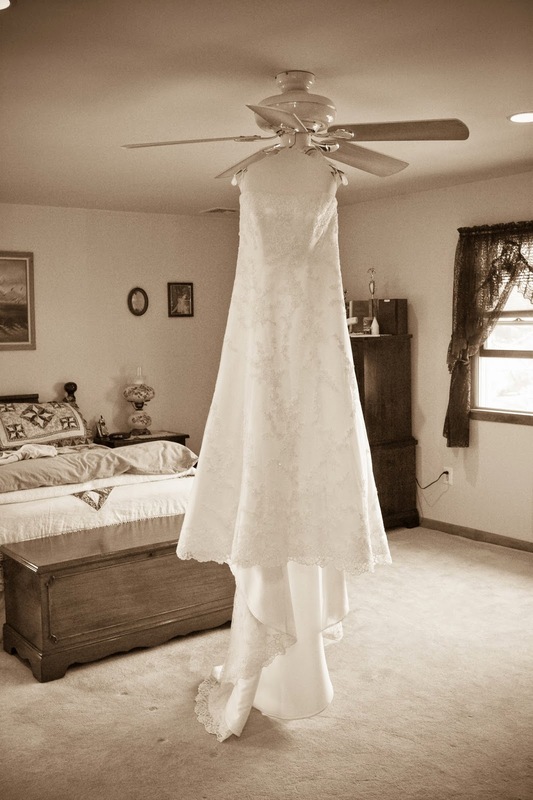 So, I am curious to know, what did you do or plan to do with your wedding dress? No wedding dresses were harmed in the making of this blog post. Both dresses remain perfectly preserved and stored. Me? In Your Inbox? Yes, Please! Copyright 2010, Kelly Morga. All rights reserved. Awesome Inc. theme. Powered by Blogger.